A new focus for the Corvette arrived in the form of a thoroughly new V8 engine which would be known and loved as the "Chevy small block". 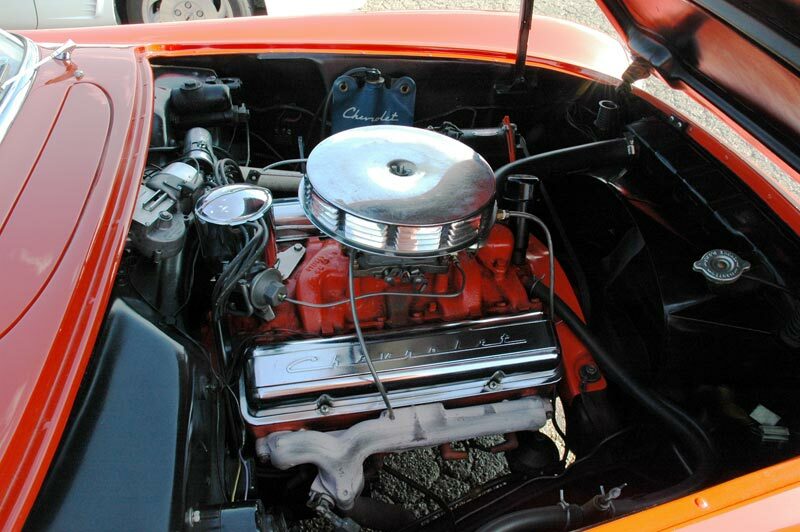 More than what the Corvette needed, it was also a major milestone in automotive engines. The engineering was advanced and featured a compact design, overhead valves and low production costs. 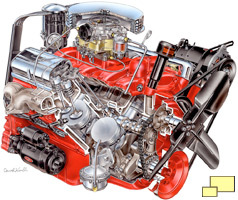 Whenever a list of the worlds most significant automobile engines is compiled, the Chevrolet small block is always included. A breath-stopping surge of power that surpasses anything you have ever imagined--that's the story of the Corvette's new 195-h.p. V8 engine. Here is a "dream" powerplant…ultra-compact, free breathing, super-efficient, the most modern valve-in-head V8 engine in the world…and it can be serviced by any Chevrolet dealer. Dual exhausts, a four-barrel carburetor, 8 to 1 compression ratio, and a high-lift camshaft squeeze latent energy out of every drop of gasoline…and careful counter-balancing of the entire engine after assembly keeps it smooth as a jet of steam. 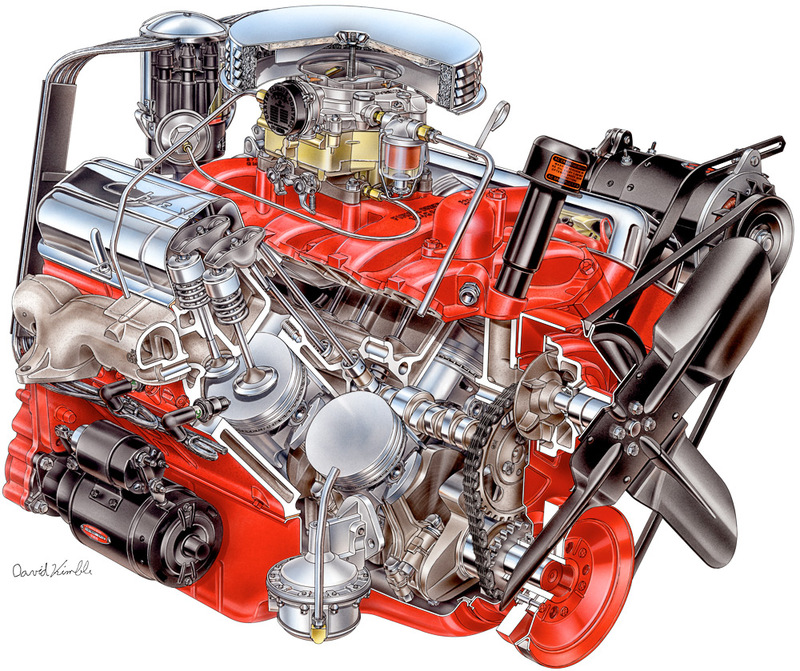 Left: Cutaway drawing by David Kimble of the new small block engine. Below: As installed in a 1955 Corvette. Its weight of 531 pounds was 41 pounds less than the six cylinder, which aided handling. All but seven of the 1955 Corvettes received this wonderful new engine; the remaining very rare cars were delivered with six cylinder engines. Additional colors were available. A few "Corvette Copper" (kind of a bronze) Corvettes were built along with Gypsy Red and a Harvest Gold. V8 engined cars would get a 12 volt electrical system; six cylinder Corvettes made do with a six volt system. An electric windshield wiper was also part of the V8 package. 700 Corvettes were produced in 1955. Chevrolet wisely did not repeat the overproduction mistake of 1954 and instead produced only what could be sold. Notes: Base Corvette with six cylinder engine: $2,774.00. Qty: 7 | Base Corvette with 265 cu. in. 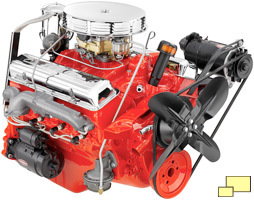 195 hp V8 engine: $2,909.00. 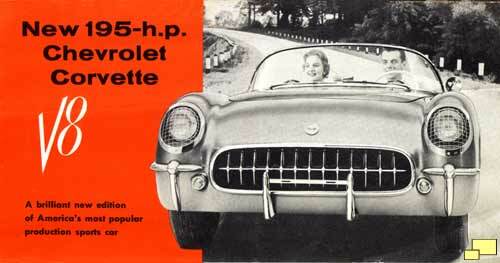 Qty: 693 | All six cylinder 1955 Corvettes came with the Powerglide automatic transmission. 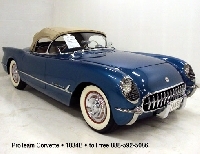 Most of the 1955 V8 Corvettes also came with the automatic; towards the end of the model run a three speed manual transmission was available and approximately 75 1955 Corvettes were so equipped. Notes: Color quantities are estimates as reliable GM records are not available.